The Nag Tibba trek is the perfect trek for newbies or for those with some experience looking for a short weekend trek. With just one night of camping, spectacular views, and a scenic trail through Himalayan villages and fields, this is a pleasant mountain getaway. Know more about the Nag Tibba trek. Enquire about the Nag Tibba trek. Situated in the foothills of the Garhwal Himalayas, in the northern state of Uttarakhand, Dehradun is a prime tourist hub as it is surrounded by opportunities for adventure. 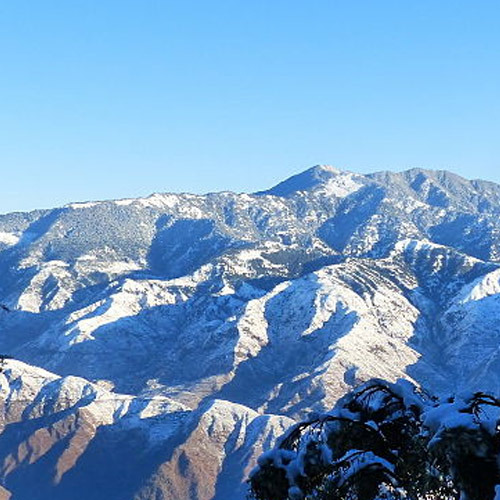 Nag Tibba or Serpent’s Peak is barely a few hours away from Dehradun and Mussoorie. The Nag Tibba trek is one of the most popular short treks in Uttarakhand. Find other adventure activities in Uttarakhand. The Nag Tibba trek is a moderately challenging one, starting at an elevation of 3500 feet and going up to the top of Nag Tibba at 10,000 feet. 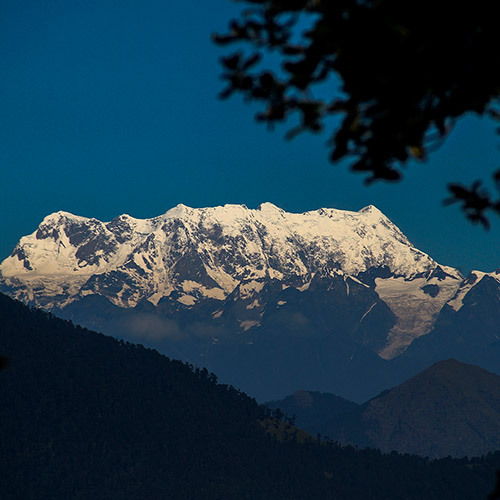 This trek offers magnificent views all the way up, from towering Himalayan peaks to the lush hills and slopes around. At night, you’ll be able to see the lights of Mussoorie glimmering in the distance. The trek begins from Pantwari, 90 km from Dehradun. Along the way you will traverse dense and misty forests of oak with orchids and scarlet rhododendron at your feet. Hills lush with purple blossoms of the Bauhinia trees make for a pretty sight. White anemones are plentiful. Goats and woolly sheep dot the hillside. Look out for birds like Flameback woodpeckers, jungle warbler, red and blue bulbul, hill myna and warblers. The Nag Tibba trek can be done all year around. 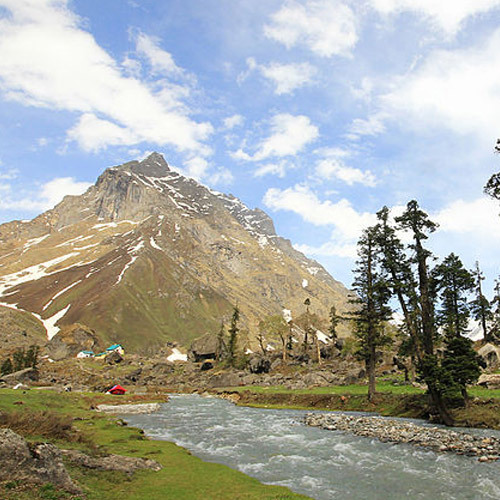 It is the perfect place for camping during summers, with bright and sunny days, temperature highs of 22 degrees C and lows of about 12 degrees C at night. During the winter, it is one of the best short winter treks, as other trails become hard to navigate due to heavy snowfall. The weather in Nag Tibba during winter varies between 0-8 degrees C. For those looking for a snow trek, Jan-Mar is the right time, depending on the snowfall that year. The Nag Tibba trek will take you to the top of a ridge peak in the Nag Tibba range of the lower Himalayas. You'll trek through delightful paths, meeting friendly farmers and locals along the way. It's about 4-5 hours of trekking, with some steep patches. At the top, your campsite will be set up for a complete outdoors experience, with basic comforts like tents, sleeping bags, toilet tents, all led by a friendly team of guides and porters. The ground is covered with wild mint, which the cook will pluck to make you a deliciously refreshing cup of tea. The rest of the evening is free for you to explore the campsite, pluck some fresh mint, and admire the spectacular views of snowy peaks like Swargarohini, Bandarpoonch, Srikanth and Black Peak. You'll camp at two different campsites, walking through mountain pastures and oak forests by day, and sleeping under the stars by night. In the morning, you'll wake to see gorgeous views of the peaks all around. On the way back you’ll visit the Nag Devta temple before beginning your descent. The Nag Tibba trek is considered to be an easy trek that beginners can do in summer or winter. 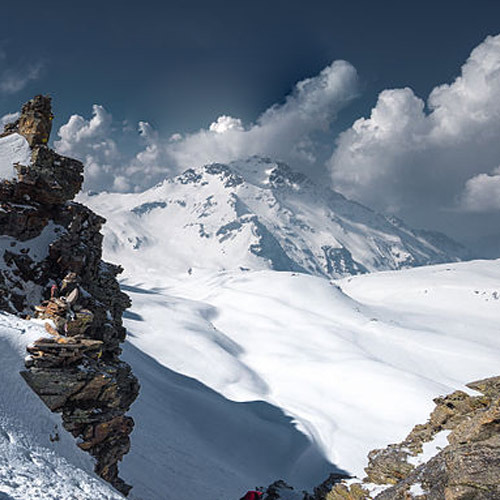 Check out other snow treks recommended for beginners. For those looking for a quick Himalayan escape, this 1 night itinerary on the Nagtibba route is a fantastic option. It takes you to the top of a ridge peak in the Nag Tibba range of the lower Himalayas, in just a day trek. You'll pass charming villages, terraced fields, and flowering trees en route to your campsite. You'll catch a beautiful sunset over the hills, and at night, you'll camp in comfortable tents with the sounds of nature outside. In the morning, you'll see gorgeous views of the peaks and of Mussoorie in the distance. On this route, you visit the Nag Devta temple on Day 2 before beginning your descent. You can expect to be back in Dehradun by 21:00 or 22:00 hrs. IMPORTANT: This is not a fixed departure trip and requires a minimum of 4 persons to book. Any costs arising out of unforeseen circumstances such as bad weather, road blocks, medical evacuations, etc. The Nagtibba trek begins from the Pantwari village, located about 10,000 feet, around the foothills of the Garhwal Himalayas. You will be immersed in midst of nature, with lush green forests, chirping birds, and the cool, fresh mountain air. Any costs arising out of unforeseen circumstances such as bad weather, road blocks, medical evacuation, etc. For a quick mountain getaway over the weekend, this overnight Nagtibba trekking experience is perfect. The early start from Dehradun station makes you feel like you're already on an exciting expedition, and it only gets better from there. You'll take a short drive to the start point, and then begin your Nagtibba trek. At night, you'll camp just beneath the Nagtibba peak, with mountains all around, and a chill in the air. The next day, by late evening, you're back at Dehradun station. For a short, easy adventure that gives you a mountain camping experience, this 2 day trek to Nagtibba is a great option. It's an easy trek and is perfect for newbies and participants with some experience. Your Nagtibba trek takes you through delightful paths, meeting friendly farmers and locals along the way. It's about 4-5 hours of trekking, with some steep patches. At the top, your campsite will be set up, and hot cups of tea are waiting. The rest of the evening is free for you to explore the campsite, pluck some fresh mint, and admire the spectacular views of snowy peaks like Swargarohini, Bandarpoonch, Srikanth and Black Peak. At night, you'll settle down to sleep in tents, with the sounds of nature all around. Any costs arising out of unforeseen circumstances like landslides, road blocks, injury, bad weather, etc. Whether you're an anxious first-timer or an experienced trekker looking for a weekend in the mountains, the Nagtibba trek will be a great adventure. 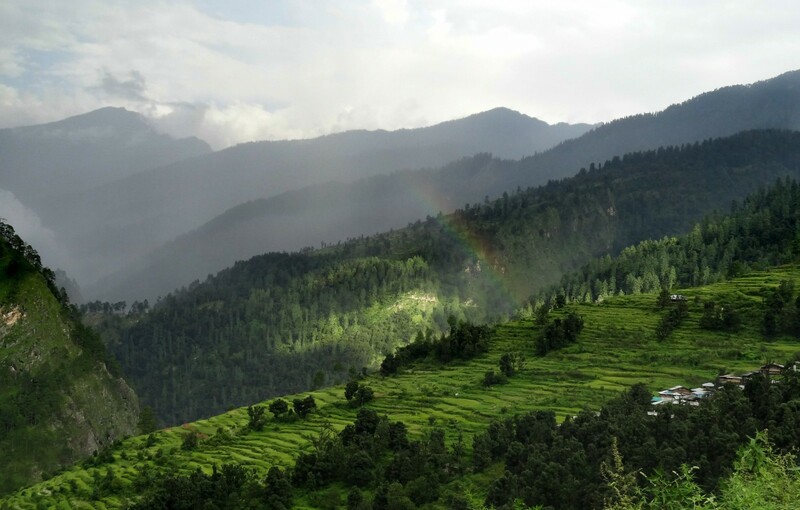 This short two-night trek to Nagtibba takes you through thick deodar forests, up winding mountain paths, and up to the Nagtibba Pea at almost 10,000 feet. You'll spend two nights in tents, wake up to birdsong, and spend your time in the lap of the mountains. As the snow falls gently from the skies above and the landscape is covered in white, a different beauty comes alive in the mountains. This is what awaits you on this trek to Nag Tibba. While the rest of the higher Himalayan ranges are closed for the winter, the Nag Tibba trek stays open, offering a special thrill to the handful of trekkers that come out seeking winter beauty and a chance to camp in the snow. For adventurers who want a taste of Himalayan snow, the Nagtibba trek is one of the best options around Mussoorie. This moderate 3-day snow trek to Nagtibba takes you up to 3000 feet, in just a few hours, but the presence of so much snow makes it feel like an expedition! You'll get beautiful views of peaks like Bandarpooch and Kedarnath Peak, if the skies are clear, but if not, you'll get time to play in the snow. For those looking for a short trek, the Nag Tibba route is a fantastic option. It takes you to the top of a ridge peak in the Nag Tibba range of the lower Himalayas. You'll camp at two different campsites, walking through mountain pastures and oak forests by day, and sleeping under the stars by night. From the top of the ridge, you'll get beautiful views of the peaks around you, as well as charming views of Mussoorie in the distance. 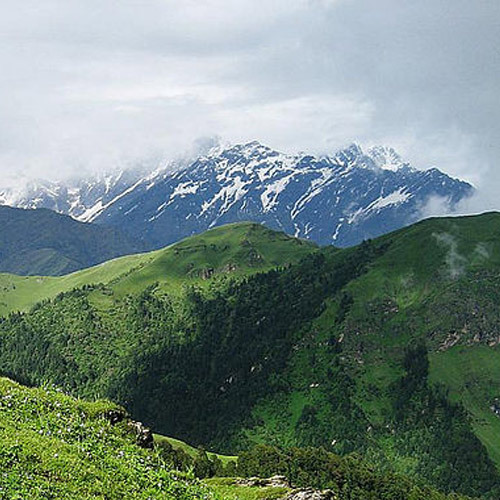 For adventurers who want a taste of the Himalayas, the Nagtibba trek trail is one of the best options around Dehradun. 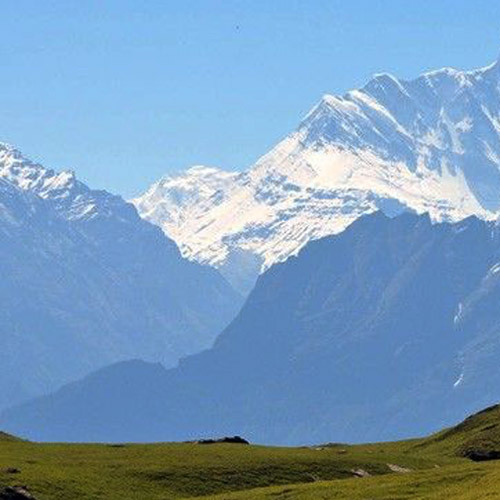 This moderate 3-day trek to Nagtibba takes you up to 3000 feet, in just a few hours, to get beautiful views of peaks like Bandarpooch and Kedarnath Peak. You'll enjoy the crisp air, trek past small villages and meet friendly locals, and camp at night with beautiful views of the lights of Dehradun in the distance. The Nagtibba trek can also be done in two days, but this relaxed itinerary of 3 days gives you time to enjoy the gorgeous scenery and the fresh air. IMPORTANT: This is a custom trek to Nagtibba and requires a minimum of 5 travellers to book. For a short, easy adventure that gives you an experience of snow, this 3 day snow trek to Nagtibba is a great option. It's a moderately challenging trek and is perfect for newbies and participants with some experience. You'll camp in tents in the snow (with mattresses and sleeping bags to stay warm), and trek through snowy trails and forests blanketed in white. At the peak of Nagtibba, you'll have layers of fresh snow to jump in, and spectacular views of the snowy peaks of Himalayan giants like Swargarohini, Bandarpoonch, Srikanth and Black Peak. The Nagtibba trek begins and ends at the beautiful hill station of Dehradun which is the capital city of the northern state of Uttarakhand. What is the packing list for the Nag Tibba trek? Your operator will carry all the camping equipment you need, so all you need is strong trekking shoes and a good backpack. Make sure you carry warm clothing, as well as woollen cap, gloves, scarf, and thermals. Is the Nag Tibba trek suitable for beginners? Yes, the Nag Tibba trek is an easy trek that beginners will enjoy. 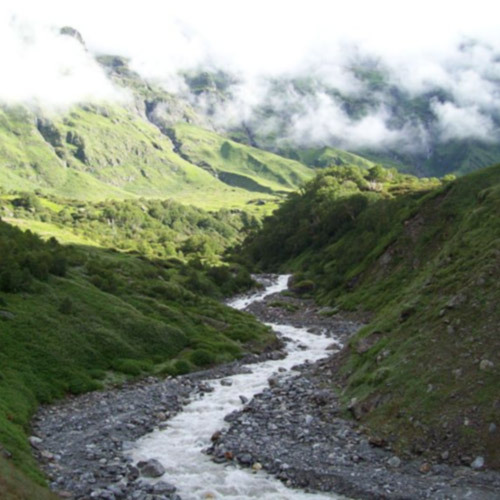 It is not too far from Dehradun, and involves only one night of camping, with two days of trekking. It’s suitable for those who have never been camping or trekking before and want to try a short experience. It’s also suitable for those who have been trekking before but are looking for a short mountain getaway. What can one see on the Nag Tibba trek? 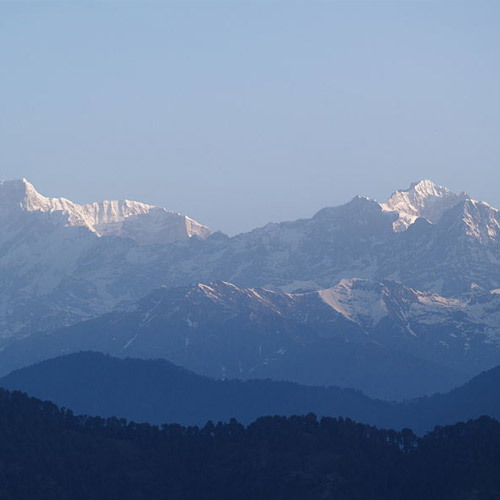 The Nag Tibba trek offers views of peaks like Swargarohini, Bandarpoonch, Srikanth and Black Peak. In the evening, from Nag Tibba top, you’ll be able to see the lights of Mussoorie glimmering in the distance. When is the best time for the Nag Tibba trek? 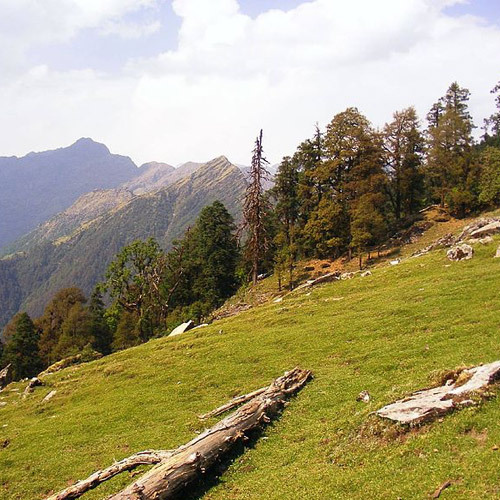 The Nag Tibba trek is a year-round trek, except for the monsoon months. The weather is usually pleasant up here, even in summer. The nights can get nippy, so do make sure you have warm clothing. How to prepare for the Nag Tibba trek? The Nag Tibba trek is an easy trek, so you only require basic fitness to make the trek. If you do any form of regular exercise such as running, yoga, cycling, swimming, or walking, you will be able to manage the trek quite easily.